Oh, if my ballot paper could tell the story of it's travels & the hope it carried on its shoulders. I'm crying in the subway now while typing this. Couldn't read the news until I finished teaching a morning class. I'm rushing home now to witness this historic moment on the news! I'm sobbing uncontrollably now & New Yorkers are probably thinking I got my heart broken. Oh, on the contrary, these are tears of joy. Hear me cry out from decades of pent up frustration & tampered hope. All the injustices I've witnessed. Totally didn't expect this. Not even close. We are at the cusp of a Malaysian spring. Looking at all the effort put in by Malaysians all around the world. How can I not be moved? I may be one of only 0.1% of voters, but I'm so so glad I took part in this. Almost didn't. Thanks so much to all the beautiful souls who made it possible for my ballot to find it's way home. After getting my ballot on Friday & finding out that it would take too long to send it home, I gave up. A few days later, a concerned Malaysian aware of my situation got me connected with someone who was collecting ballots all over NYC to be sent from JFK to KLIA via a friend that night itself. 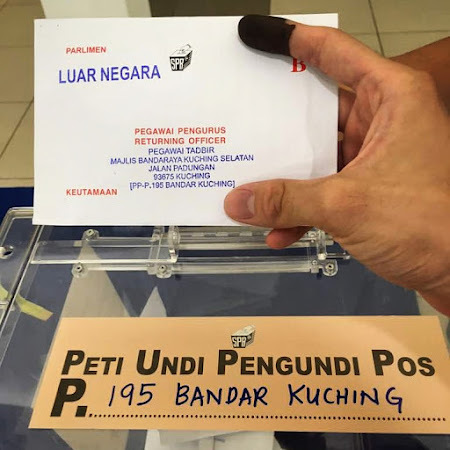 I rushed to the airport to hand over my ballot without any plans for having it brought back to Kuching from KLIA. I didn't think that I'd be able to find someone, but I had to give it a try. I galvanized social media to help share my plea. Hundreds responded, shared, sent messages, & made calls. After 7 hours, someone was found for me whose flight to Kuching was perfectly timed to collect the ballot from KLIA on the afternoon of May 9th & have it arrive in Kuching with plenty of cushion time. My heart exploded! This was the hardest part! I was easily able to find a volunteer to hand deliver my ballot to the RO. The awesome bro did so after voting in the morning. You can see his ink-stained hand in the picture. My ballot traveled half-way across the world to join 40k+ of it's brothers in making our voices heard, bringing about change & calling for an end to corruption. What a day, Malaysia! What a day! Overjoyed that this is the Malaysia I am returning to in a few months! 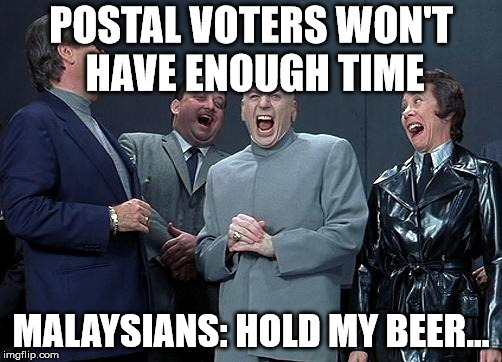 So proud of you, Malaysia!